Along with the Stone Roses, Happy Mondays were the leaders of the late-’80s/early-’90s dance club-influenced Manchester scene, experiencing a brief moment in the spotlight before collapsing in 1992. While the Stone Roses were based in ’60s pop, adding only a slight hint of dance music, Happy Mondays immersed themselves in the club and rave culture, eventually becoming the most recognizable band of that drug-fueled scene. The Mondays‘ music relied heavily on the sound and rhythm of house music, spiked with ’70s soul licks and swirling ’60s psychedelia. It was bright, colorful music that had fractured melodies that never quite gelled into cohesive songs. Unwittingly or not, Happy Mondays personified the ugly side of rave culture. They were thugs, purely and simply — they brought out the latent violence that lay beneath the surface of any drug culture, even one as seemingly beatific as England’s late-’80s/early-’90s rave scene. Under the leadership of vocalistShaun Ryder, the group sounded and acted like thugs, especially in comparison with their peace-loving peers, the Stone Roses. Ryder‘s lyrics were twisted and surrealistic, loaded with bizarre pop culture references, drug slang, and menacing sexuality. Appropriately, their music was as convoluted. 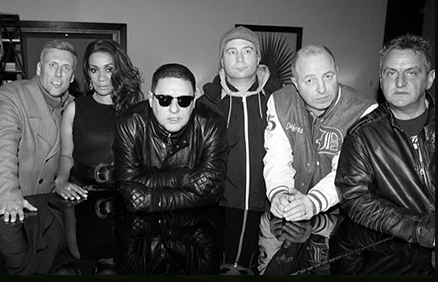 Happy Mondays were one of the first rock bands to integrate hip-hop techniques into their music. They didn’t sample, but they borrowed melodies and lyrics and, in the process, committed rock blasphemy. For a band that celebrated their vulgarity and excessiveness, Happy Mondays appropriately were undone by their addictions, but they left behind a surprisingly influential legacy, apparent in everyone from dance bands like the Chemical Brothers to rock & rollers like Oasis. With their second album, 1988’s Bummed, Happy Mondaysbecame British superstars, particularly Ryder. Pills ‘n’ Thrills and Bellyaches, released in 1990, marked the height of the band’s popularity, creativity, and influence; although the record made the Top 100 albums chart in America, it didn’t establish them as stars in the U.S. After that, the fall was quick. By the time they released their next studio album, Yes, Please, Manchester had disappeared from public consciousness; it sold respectably, but the group didn’t have the commercial impact that they had just two years before. Besides the lack of public interest, Shaun Ryder had become addicted to heroin, tearing the band apart in the process. At a high-level record contract meeting, Ryderwalked out for some “Kentucky Fried Chicken,” which was the band’s slang for heroin. He never returned and the group quickly fell apart. Ryder and The Mondays‘ full-time dancer, Bez, re-emerged in the mid-’90s with Black Grape. The band released its critically acclaimed debut, It’s Great When You’re Straight…Yeah, late in the summer of 1995. Black Grape‘s sound pursued the same direction as The Mondays, only with a harder, grittier edge to their sound and lyrics. In 2007, 15 years since their last record, the band (minus about half the original members, including guitarist Mark Day) released their fifth studio album,Uncle Dysfunktional. They recently reformed and have been playing sold out shows around the world since.